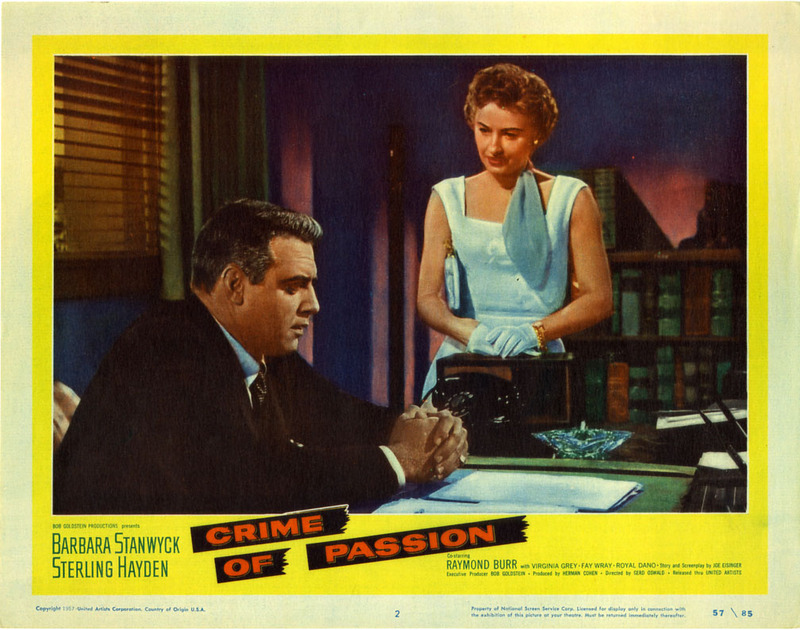 Crime of Passion is a film noir from 1957 with 3 of noir’s greatest. 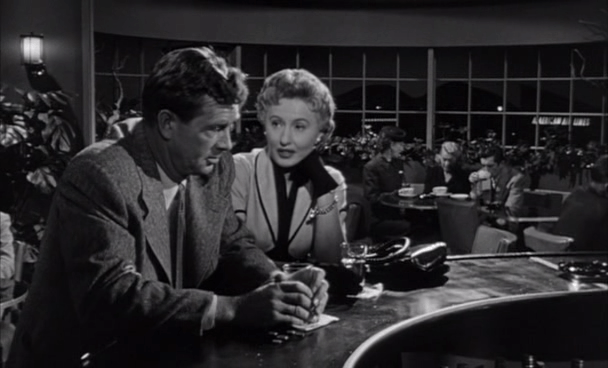 We Have Barbara Stanwyck, Sterling Hayden and Raymond Burr in a love triangle that can not end well. Gerd Oswald directs this film, written by Jo Eisinger. This story starts out with Stanwyck working at a paper as an advice columnist for a San Francisco paper. She gets put on a story against her will where she meets a couple Los Angeles cops who fly up about the case. One of the cops is Hayden and Stanwyck falls in love in short time. She soon moves down to Los Angeles and marries Hayden. She has problems getting along with the other cop’s wives and doesn’t handle the stress of being a cop’s wife herself. We soon learn that Hayden’s boss is Burr and an old flame of Stanwyck’s. Burr is also married, his wife is played by none other than Fay Wray. Wray is very sick and this is hard on Burr. Soon Burr and Stanwyck start seeing each other again. This love triangle does not end well and our story really heats up. This film is short and starts out quit slow, but it heats up in the last half hour. The film plays as a bit of a psychological thriller and Stanwyck is getting the ball rolling on the psychotic femme fatale that we would see in future films like Fatal Attraction. Hayden is very good playing his every man’s man, as he always does. Burr is real good playing somebody with a lot of power and is very strong, but when he lets his guard down and shows some weakness it is very believable. Stanwyck is good as always and you could watch this again just to get all the little nuances of her performance. Wray plays a smaller part, but does a good job with it. This is a good film and well worth watching. Just give it some time to get started as the first half of the film is a little dull and slow. It quickly builds to an interesting noir by the end. What I find most interesting in the film is the potential feminist reading of how quitting a career and living as a middle-class housewife is arguably what causes Stanwyck to go femme fatale. Because it’s noir not melodrama/woman’s film, Stanwyck’s psychology is underdeveloped. But it’s still a unique noir for its era, and less misogynistic than Fatal Attraction and other 80s representations of women driven to evil-doing by frustrated ambition. Wow, I never thought of that, good point. I had my own theories, one is she had to choice one of them and when she finally did, she had to destroy the other. With the 3 leads I consider this a disappointment over all. Perhaps it’s just about 5 years to late to really hit it’s mark.